What is a Blue Screen of Death? 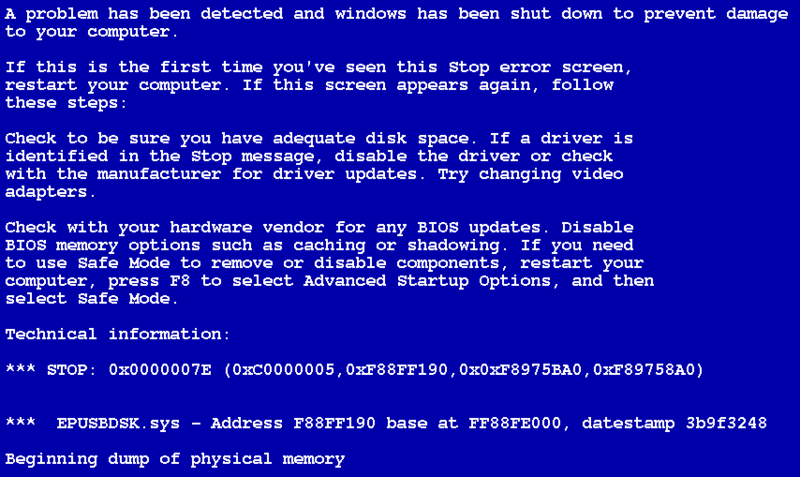 If you’ve ever been around computers, you’ve likely seen at least one ‘blue screen of death’ or BSOD. It is a screen filled with cryptic code making you feel like the end is near for your PC. Take a deep breath and don’t panic. The first thing you want to do is write everything down on the screen or take a focused picture of the screen with your camera or cell phone so you have documentation of the error. Pay close attention to any STOP errors or filenames as they can be keys to troubleshooting the problem. After you have documented the error message, try restarting the computer. You may need to use the power button the computer as the keyboard may not be responsive. Did it boot back up normally or did you get another blue screen of death? If you get the error message again, try booting up into safe mode. (Push the F8 key before Windows starts up to find the safe mode option). If it boots into Windows, this will help narrow down if it’s a driver/software issue. No luck? Keep digging! Ask yourself what has changed on your PC. Have you installed or updated any software or drivers recently? What about any new hardware like a printer or camera? If so, try uninstalling the software and removing the device to see if that eliminates the error. Still not working? It is possible that it is something inside the computer that is failing. I have had memory (RAM) go bad which causes various blue screens of death. Try testing the RAM with a program like MemTest86+ and see if it fails. While you are testing things, it’s probably a good idea to scan the hard drive for any errors. Use a tool like Seatools to scan for any hardware errors. I would also suggest running CHKDSK /F to see if that helps. Have you ever seen a blue screen of death? If so, how did you resolve it?